Watering crops can be one of the most difficult jobs in nursery production and requires careful attention. Under watering crops can lead to cell dehydration, while overwatering can reduce the oxygen content of the substrate (Kläring and Zude, 2009) and lead to reduced root respiration (Drew and Lynch, 1980). By elevating the dissolved oxygen level of irrigation water, roots would be exposed to more oxygen in the root zone, which could improve root growth. Therefore our objective was to evaluate the effect oxygenated irrigation water has on Lavendula angustifolia ‘Provence’ (lavender). Fig. 1. a. The Oxygen Research Group's Portable Product, was used to elevate the dissolved oxygen level of the irrigation water by, b. Oxygen molecules are split into two creating micro-bubbles, c. portable dissolved oxygen meter attached to a LDO101 probe (Hach Company). (a.) or 7.2 mg/L: (b. ), root dry weight was greater for lavender irrigated with 13.3 mg/L (c.) compared with plants irrigated with 7.2 mg/L (d.) dissolved oxygen. Effects of oxygenated irrigation water on growth of ‘Provence’ lavender grown in containers. zFGI: final growth indices (average of three tallest growth points + width1 + width2) ÷ 3. yMeans (within a column) with the same letters are not significantly different according to Tukey's least significant difference test, alpha = 0.05. Kläring, H.-P. and M. Zude. 2009. Sensing of tomato plant response to hypoxia in the root environment. Scientia Hort. Drew, M.C. and J.M. Lynch. 1980. Soil anaerobiosis, microorganisms, and root function. Ann. Rev. Phytopathol. 18:37-66.
conditions. Proc. IS on Soilless Cult. And Hydroponics. Acta Hort. 697. There were no differences in growth indices or shoot biomass of lavender irrigated with elevated dissolved oxygen compared to lavender irrigated with the control level (Table 1). 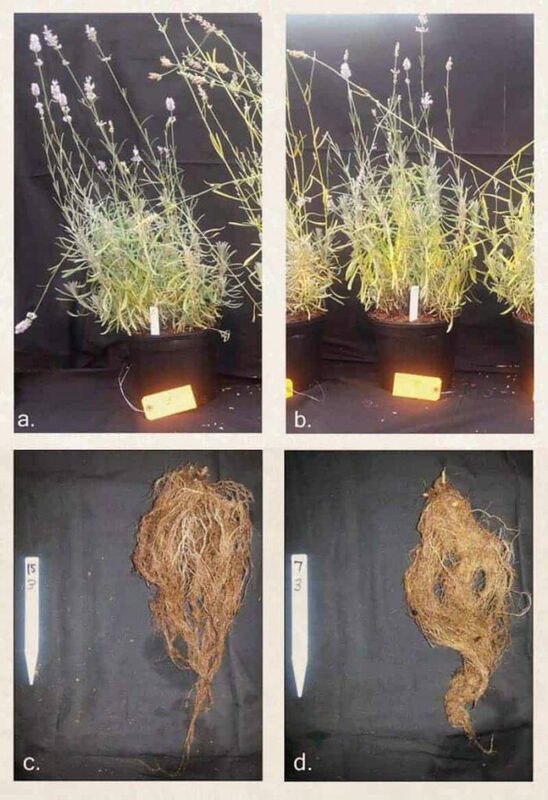 However, root biomass was 21% greater for lavender irrigated with elevated dissolved oxygen compared to plants irrigated with the control level. These results are similar to Marfà et al. (2005) who reported an increase in fine roots (less than 2 mm) of peppers grown in Rockwool irrigated with 16 ppm dissolved oxygen compared to their control level of 6 ppm. Based on our results, elevating the dissolved oxygen level of irrigation water can improve root growth of container grown lavender. We acknowledge Andrea Menendez, Marisol Benitez-Ramirez, and Phil Flanagan for technical assistance and Kim Holden’s Nursery for supplying the water source.